Peritoneum is the most extensive serous membrane in the body. 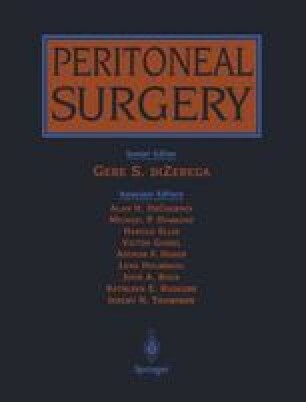 The surface area of the peritoneum is generally equal to that of the skin (Table 1.1). 1 It forms a closed sac in the male and an open sac in the female because the ends of the fallopian tubes are not covered by peritoneum. The peritoneum lines the walls of the abdomen (parietal peritoneum) and is reflected over the viscera (visceral peritoneum). It consists of two layers, a loose connective tissue and a mesothelium. The connective tissue is arranged into loose bundles that interlace in a plane parallel to the surface. There are numerous elastic fibers, especially in the deeper layer of the parietal peritoneum, and comparatively few connective tissue cells. The peritoneum serves to minimize friction, facilitating free movement between abdominal viscera, to resist or localize infection, and to store fat, especially in the greater omentum.